My computer is running slow! Help what can I do? In this article you can find instructions to fix a slow PC and make the computer faster. A slow computer is one of the most frustrating things that can happen. There are several reasons why you can get a slow computer, but the most common one is: lack of PC maintenance. 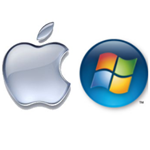 Depending on whether you have a Windows or a Mac system, the instructions to fix a slow computer are different. Windows operates in a different way than OS X. In this page you can find instruction to fix a computer with Windows as operating system. Do you own a Mac? Read then the article: mac running slow. Cleaning up the PC is an essential task, to prevent this kind of problems. I am aware that cleaning your computer is a boring and time consuming task; also not all tasks are easy to perform. But it is really important that once and a while a computer clean-up takes place. Of course there exist software that can help you with these tasks. Regcure Pro is an excellent program that cleans, repairs and updates your system. Try and download Regcure Pro. Why is my computer so slow? To determine possible causes of a slow computer, we have to discriminate three different types: a slow computer at start-up (boot is slow), slow PC when starting software or constantly having a slow computer. When your computer is running slow a boot time, than it is important to know what is happing behind the scenes. At the moment the operating system of Microsoft boots, a lot of processes are started. The first thing that Windows does is, it loads its start-up configuration, a specific set of configuration retrieved from the Windows registry specifying exactly what services, software and drivers must be loaded. Here can we identify three possible causes which might turn your PC in a slow computer. The Windows registry, the source where all system configurations are stored is too big; it contains some much information that finding the information needed takes too much time. And therefore the registry must be cleaned up. The Windows registry contains errors or is corrupted. The registry must be repaired. There are a lot of start-up services installed in your computer. A start-up program is a third party software component that is started at the moment Windows starts, how more of these services are activated on your computer how slower he gets. Deactivating start up services is therefore needed. As you may have noticed, the Windows registry plays an important role. A lot of people compare the registry with the human brain. It is involved in all operations on your computer. Cleaning and repairing the registry can therefore solve a lot of these kinds of problems. See for more information: Computer clean up. Do you notice that starting a software program takes more time than before? Or it seems to freeze your computer at specific moments? Than your problem may fall under the category an occasionally slow computer. Your computer is infected with a virus. When your computer is infected by a virus a direct drop of performance can be noticed. It depends on the type of virus. Also Spyware or Adware can make your PC really slow. You can see Spyware/adware a lot in combination with your web browser. A lot of people download plugins for their browser, which are loaded with ads or buttons and stuff, which makes starting your browser time consuming operation. More information you can find on: internet slow. As with everything that is running on your Windows operating system, the Windows registry is consulted all the time. To find specific drivers, paths, files user setting and much more. If you have a damaged Windows registry you can get all kinds of problems. Please check the page: clean-up PC for more information. Another possible cause could be a problem with one of your hardware drivers. If you for example start a game, the system will load the drivers of the graphical card. When those drivers are not working correctly, or they are working with the wrong versions than you can have hardware performance problems. When your computer is constantly slow, than you could have a combination of several problems. Because finding the problem can be very complex, because one problem is caused by another, I recommend that you start with a clean-up. If that doesn’t help, try a Pc clean-up tool like Pc Health Advisor. You can download it here and perform a system health scan. [doctor title=”Perform a system health scan to determine the cause of a slow computer” linktxt=”Click here and download Pc Health Advisor.” desc=”Pc Health Advisor can indicate why your computer is running slow” product=pc-health-advisor]. Pingback: What is the value of the Uniblue SpeedUpMyPC 2014?